A notre usine malaise une équipe d’env 50 employées habiles sont occupées à confectionner de verveux de haute qualité. Appronet exporte ses produits vers la plupart des pays européens. La gamme de production comprend: nasses à anguille, à crevettes, à morue et à crabes, ainsi que de casier à homard et à crabes. Beaucoup de nos verveux sont présentés sur les pages à suivre. S’il vous faut un modèle spécial, contactez nous pour avoir une proposition. Appronet dirige également notre production de verveux en Chine, où une cinquantaine de monteur/monteuses confectionnent de produits de haute qualité. Les monteur travaillent chez eux à la maison et leur produits sont surveillés journellement. Type 60/5 double is made of 2 fykes with 5 meter leader between them. The mesh size of the cod end is 11 mm. The front ring has a 60 meshes span and is app. 40 cm high. Each fyke has 5 rings or hoops and 3 tunnels. Type 60/5 is often used by leisure time fishermen. filet avant 17 mm // aile 18 mm // anneaux d’acier min. 4 mm. Type 75/5 eelfyke single is made of 1 fyke and a 6 meter leader mounted on the front ring. The mesh size of the cod end is 11 mm sq. The front ring has a 75 meshes span and is app. 47 cm high. Each fyke has 5 rings or hoops and 3 tunnels. Type 75/5 eelfyke double is made of 2 fykes with 6 meter leader between them. The mesh size of the cod end is 11 mm. filet avant 17 mm // aile 18 mm // anneaux en acier min 4 mm. Type 79/5 eelfyke double is made of 2 fykes with a 6 meter leader between them. The mesh size of the cod end is 11 mm sq. The front ring has a 79 meshes span and is app. 52,5 cm high. Each fyke has 5 rings or hoops and 3 tunnels. Type 80/5 eelfyke single is made of 1 fyke and 2 wings of 1.5 meter. The mesh size of the cod end is 11 mm sq. The front ring has an 80 meshes span and is app. 45 cm high. Each fyke has 5 hoops or rings and 2 tunnels. Type 80/5 eelfyke double is made of 2 fykes and 6 meter leader between them. The mesh size of the cod end is 11 mm. The front ring has an 80 meshes span and is app. 45 cm high. Each fyke has 5 rings or hoops and 2 tunnels. Type 80/7 B eelfyke is made of 1 fyke and a 6 meter leader mounted on the front ring. The mesh size of the cod end is 10 mm sq. The front ring has an 80 meshes span and is app. 52.5 cm high. Each fyke has 7 rings or hoops and 3 tunnels. Type 80/7 B eelfyke double is made of 2 fykes and a 6 meter leader between them. The mesh size of the cod end is 10 mm sq. filet avant 16 mm // aile 16 mm // anneaux inox min 4 mm. Type 80/7 eelfyke single is made of 1 fyke and two wings of 4 meter each. The mesh size of the cod end is 11 mm no. 5. The front ring has an 80 meshes span and is app. 55 cm high. Each fyke has 7 rings or hoops and 3 tunnels. Type 80/7 eelfyke double is made of 2 fykes and an 8 meter leader between them. The mesh size of the cod end is 11 mm no. 5. Forbøjlen spænder over 80 masker net og er ca. 55 cm høj. The front ring has an 80 meshes span and is app. 55 cm high. Each fyke has 7 rings or hoops and 3 tunnels. Type 80/7 eelfyke single is made of 1 fyke and a leader of 8 meter. The mesh size of cod end is 9 mm. Type 80/7 eelfyke double is made of 2 fykes and a leader of 8 meter between them. The mesh size of the cod end is 9 mm. filet avant 14 mm // aile 14 mm // anneaux en acier min 4 mm. Type 100/7 eelfyke single is made of 1 fyke and a leader of 8 meter. The mesh size of the cod end is 11 mm. The front ring has a 100 meshes span and is app. 60 cm high. Each fyke has 7 rings or hoops and 3 tunnels. Type 125/7 large eelfyke single is made only of 1 fyke without leader. The mesh size of the cod end is 11 mm. The front ring has a 125 meshes span and is app. 70 cm high. Each fyke has 7 rings or hoops and 3 tunnels. Type 150/7 large eelfyke single is made only of 1 fyke without leader. The mesh size of the cod end is 11 mm. The front ring has a 150 meshes span and is app. 90 cm high. Each fyke has 7 rings or hoops and 3 tunnels. Type 200/7 large eelfyke single is made only of 1 fyke without leader. The mesh size of the cod end is 11 mm. The front ring has a 200 meshes span and is app. 125 cm high. Each fyke has 7 rings or hoops and 3 tunnels. filet avant 20 mm // anneaux en acier min 4 mm. Type 65/5 codfyke single is made of 1 fyke with 10 meter leader. The mesh size of the cod end is 30 mm. The front ring has a 65 meshes span and is app. 72 cm high. Each fyke has 5 rings or hoops and 2 tunnels. Type 65/5 codfyke double is made of 2 fykes with 10 meter leader between them. The mesh size of the cod end is 30 mm. aile 45 mm // anneaux en acier min 4 mm. Type 65/7 codfyke single is made of 1 fyke with 10 meter leader. The mesh size of the cod end is 30 mm. The front ring has a 65 meshes span and is app. 90 cm high. Each fyke has 7 rings or hoops and 3 tunnels. Type 65/7 codfyke single is made of 2 fykes with 10 meter leader between them. The mesh size of the cod end is 30 mm. filet avant 40 mm // aile 45 mm // anneaux en acier min 4 mm. Type 49/4 crabfyke double is made of 2 fykes with 6 meter leader between them. The front ring has a 49 meshes span and is app. 45 cm high. Each fyke has 4 hoops or rings and 3 tunnels. Filet polyethylène cablé 380/21 // 32 mm partout // aile 32 mm. Type 160/4 shrimpfyke single is made of 1 fyke with 10 meter leader and 2 wings of 4 meter. The mesh size of the cod end is 8 mm. The front ring has a 100 meshes span and is app. 55 cm high. Each fyke has 4 rings or hoops and 2 tunnels. Type 160/4 shrimpfyke double is made of 2 fykes with 10 meter leader between them. Them mesh size of the cod end is 8 mm. The front ring has a 160 meshes span and is app. 55 cm high. Each fyke has 4 rings or hoops and 2 tunnels. filet avant 10 mm // aile 11 mm // anneaux en acier min 4 mm. Type 160/5 shrimpfyke single is made of 1 fyke with 10 meter leader and 2 wings of 4 meter. The mesh size of the cod end is 8 mm. The front ring is has a span of 160 meshes net and is app. 60 cm high. Each fyke has 5 rings or hoops and 3 tunnels. Type 160/5 shrimpfyke double is made of 2 fykes with 10 meter leader between them. The mesh size is 8 mm. The front ring has a 160 meshes span and is app. 60 cm high. Each fyke has 5 rings or hoops and 3 tunnels. filet avant 15 mm / aile 11 mm // anneaux en acier min 4 mm. Type 200/4 shrimpfyke single is made of 1 fyke with 10 meter leader and 2 wings of 4 meter. The mesh size of the cod end is 8 mm. The front ring has a 200 meshes span and is app. 65 cm high. Each fyke has 4 rings or hoops and 2 tunnels. Type 200/4 shrimpfyke double is made of 2 fykes with 10 meter leader between them. The mesh size of the cod end is 8 mm. The front ring has a span of 200 meshes and is app. 65 cm high. Each fyke has 4 rings or hoops and 2 tunnels. filet avant 10 mm // aile 11 mm // anneaux en acier min. 4 mm. Bitonet is a product for impregnating fykes in order to extend the durability. 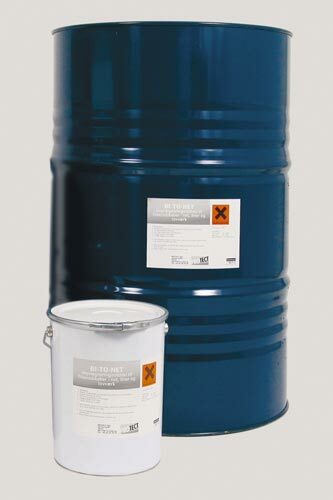 It can be delivered in cans of 10 or 25 l or barrels of 200 l.
The barrels of 200 l Bitonet can also be delivered with added foulingreducing copperoxyde. Otter protectors are used for protecting the stand of otters. When the protector is put in the front tunnel the otter is prevented from swimming in there. The protector is available in plastic as well as metal and is easy to mount to the fyke. Pound nets are sold in Greenland where the conditions for fishing with pound nets in the fiords are ideal. A pound net consists of 2 elements: Pound net and leader. The pound net is produced in various ways. The circumference varies from 40 to 60 fathoms and the depth varies from 6 to 15 fathoms. Please contact us for the best offer for the pound net that meets your demands. Eel traps differ from fykes by not being mounted with leader and there are 5 rings or hoops of equal size – approximately 30 cm high. The eel trap has 3 sticks mounted of which one has a metal sink attached to it. The bait is placed in the bait bag and the eel trap is lowered to the bottom and placed for instance near a wharf. The eel trap has throughout time been used by professional fishermen. Today the eel trap is mainly used by leisure time fishermen. Knotless net no 4. // 8 mm // 120 masker // 30 cm høj // 5 bøjler // stretch lenght: 140 cm. Eelbags are used for keeping the catch of eel until they can be delivered. The eelbags are sewn from surplus nylon netting – no net has a mesh size above 11 mm. Stainless steel rings is the only type of rings being used for making hoop nets. The front ring can be delivered either as round or flat type (D-type). It is important that the steel wire used for making the ring has the right alloy that ensures the stiffness and stability of the ring. Fyke hoop protection is used with the purpose of protecting the rings on the fyke from wearing from the ground. They are delivered in rolls of 50 m and mounted by the fisherman. With the purpose of central authority being able to control every fishingnet and every buoy being used for fishing in Danish waters, they must be marked with name and number of the fishing permit. Professional fishermen must use white markers and leisure time fishermen must use yellow signs. Eel tongs are used for sorting eel and can be delivered as both a galvanized and a plastic tong. The tool is indispensable for sorting eel. The use of skinning tong for skinning the eel and making it ready for cooking is a major advantage. The tong is handy and easy to use. The shrimp net is used by leisure time fishermen. The shrimp net is swept over the ground thus catching crabs, fry and shrimp. The crabs and fry are sortet out, the shrimp is cooked and ready to put on the table. Shrimp sweeping is a hobby for the whole family. The assortment of lead sinkers consists of varieties to be used for eel fykes, eel traps and many other types of fykes as well as varieties to be used for trawls and seine nets. We also have environment friendly sinks, used for production of any kind of fykes.